If you’ve been doing keyword research for a while, you’ve probably fallen into a routine. And that routine has likely been recently disrupted… thanks, Google. If you’re new to keyword research, getting comfortable with new keyword research tools will come more easily to you. Lucky pups. But us change-averse old dogs can still learn new tricks when we need to. Are you ready to see which tool is right for you? –Woof. I’m new to Moz and don’t want to be crucified for criticizing our own keyword research tool. This concern has only been met with acceptance and encouragement, so…*fingers crossed* they don’t change their minds. Love you guys! My methods of keyword research revolve around finding qualified traffic for increasing conversions, not just any large search volume numbers (to make traffic look good). I fear that this will come across as a Moz Keyword Explorer soft sell. It’s not. It’s a very honest comparison of Moz Keyword Explorer versus Google’s Keyword Planner. It’s a post that I’ve been wanting to read for a while. Here are some great guides if you need a Moz Keyword Explorer refresher, or a Google Keyword Planner refresher. Any habits we’ve held onto with Google Keyword Planner were disrupted early September when they decided to stop providing average monthly search volume data (unless you’re in that special group of higher-paying ad buyers who can still access the more precise search volume data). Instead, we now see huge swings of min-max search volume, which really starts to muddy the keyword research waters. Google recently came forward to explain that this change was done to deter scrapers from pulling their search volume data. For a more comprehensive write-up on this change, read Google Keyword Unplanner by Russ Jones. He explains a little more about how this change affects various data sources and what Moz has been doing to mitigate the impact. A 900,000 average monthly search volume swing is crazy! In fact, Google now only provides one of seven volume sizes: 0–10, 10–100, 100–1000, 1000–10000, 10000–100k, 100k–1MM and 1MM+. Moz’s Keyword Explorer also gives ranges, but they’re not nearly as vast (or as arbitrary). The machine-learning model behind Keyword Explorer is designed to predict monthly fluctuations in search volume. It’s mathematically tied to the most accurate keyword data available, and you can see exactly how, and how accurate Moz gets in this Clickstream Data to the Rescue article. What’s most important to you when doing Keyword Research? Quality keywords successfully target your demographic during their acquisition phase (education – purchase), have a specific searcher intent, low-medium organic competition, and medium-high search volume (this will vary based on what part of the acquisition funnel you’re targeting). However, it’s important to keep in mind that some longer-tail queries (with little to no search volume) can be highly profitable as well. This is my familiar ol, kooky friend that has been acting very strange lately (anyone else noticing all of the delays and glitches?). I’m a little worried. Make sure the region is set to United States (if wanting to research nationally). Set keyword options to “broad.” –Settle down, we’ll go back and change this to “closely related” after our first swoop. Sort keyword volume by highest to lowest and change the “show rows” to 100. IMPORTANT: Always scroll top to bottom! Otherwise, new keywords will populate from the bottom that you’ll miss. Select keywords with unique intents as you scroll down the first 100 rows, click “next,” and start again from the top until through all keyword results. My hip new friend that I’m not sure I can trust just yet. However, multiple trusted friends vouch for her integrity and… I really dig her style. Enter your keyword into the Keyword Explorer search bar. Navigate to “Keyword Suggestions” on the left-hand menu. Sort keyword list by highest search volume to lowest. Scroll down and select keywords with unique searcher intent. Either way, this will give you one giant list of 1,000 keywords, which can be tough to pace through (compared to the 100 keyword chunks in GKP). A progress bar of sorts would be nice. *It’s important to note that the KWP “Competition” metric is an advertising metric. Despite this metric occasionally leading to an SEO correlation, it’s often misleading and not an accurate representation of how competitive the organic results are. The KWE “Difficulty” metric, on the other hand, is an organic search metric. It also leverages a smarter CTR curve model to show when weaker pages are ranking higher (in addition to other ranking signals). That being said, having to wait to find out the competition metric of a keyword until after I add it to a list is frustrating. I can’t help but feel that I’m not selecting keywords as strategically as I could be. Hopefully, Moz will add a historical competition metric up front (adjacent to search volume) sometime in the near future to help us better select ripe keyword opportunities. The relevancy metric doesn’t do much to help my research because I’m already relying on the keywords themselves to tell me whether or not they’re relevant/have a unique user intent. Navigational: Searchers seeking a destination on the web. Informational: Searchers researching, getting quick answers, often times using what, who, where, how, etc. modifiers. Commercial Investigation: Searchers investigating beyond an informational query. Comparing brands, searching for “best,” researching potential clients, etc. Transactional: Searchers looking to purchase something, comparing rates, seeking prices for things, etc. Transactional and Commercial Investigation types tend to be most profitable (depending on business model). For example, a blog could do very well from Informational-type keywords. If you want a more in-depth understanding of keyword types; read Rand’s Segmenting Search Intent. <– An oldie, but a goodie!! Which tool provided better long-tail results? Which tool provided better top-of-funnel queries? What percentage of “keyword types” did each tool provide? What are the advantages and disadvantages of each tool? For whatever reason, “student loans” painted an accurate picture (of what I’ve found to be true across other competitive keywords) for each prospective tools’ wheelhouse. So, “student loans” will serve as our point of reference throughout this comparative analysis. The Importance metric: …is powerful! However, I’ve left all my results at a neutral Importance (3) so you can see downloaded results without any customization (and to keep things fair, because I’m not prioritizing GKP keywords). If you choose to use this metric, you set a priority level for each keyword (1=not important, 10=most important) that will then influence the keyword’s Potential score. 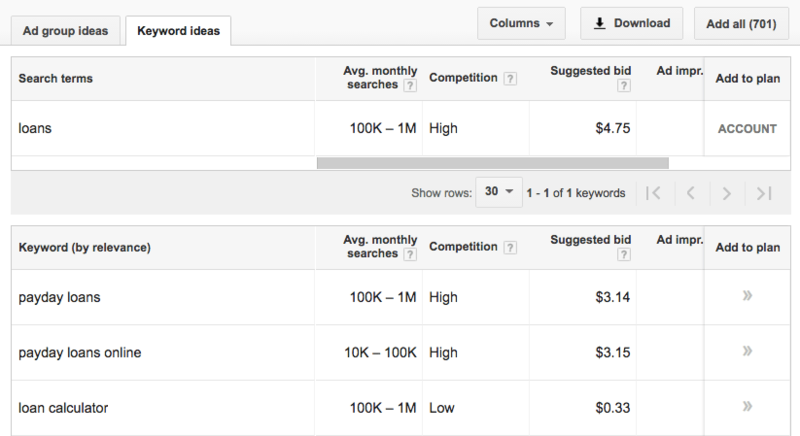 This allows you to more easily prioritize a keyword plan, which is very helpful. Group keywords with low lexical similarity: While this can save you time, it can also lead to missing keyword opportunities. In my example below, if I select “student loans” (and not “Select 821 keywords in group”), I would miss all of the nested keywords. Google Keyword Planner largely uncovered Commercial Investigation and Informational queries. GKP also better identified a broader set of top-of-funnel keyword opportunities: student loan help, parent student loans, types of student loans, etc. Moz Keyword Explorer largely uncovered Informational and Navigational queries. MKE better identified longer-tail keyword opportunities: how to get a school loan, apply for student loan online, apply for student loan by phone, etc. Note: Your .csv download will still say “Broad” for Google Keyword Planner, even though you’ve selected “Closely related”… Told you she was acting funny. Google Keyword Planner largely uncovered a pretty even percentage of all 4 keyword types (30% Informational, 20% Navigational, 30% Commercial Investigation, and 20% Transactional). GKP also continued to provide a broader set of top-of-funnel keyword opportunities: student loan bankruptcy, student loan gov, student loan help, how to get a student loan, etc. Moz Keyword Explorer largely uncovered Commercial Investigation and Informational queries. MKE also continued to provide a broader set of long-tail keyword opportunities: student loan forgiveness for teachers, student loan providers, student loan status, how do i find my student loan, etc. Let’s explore the other available Moz keyword filters and examine the discovered keyword results (keywords with unique intent). One of the more evenly distributed (search volume) results in this example. Most keyword results are around other types of loans or grants: payday loan, pell grants, auto loan, private loans, etc. Results are mostly three words or longer and revolve around more specific types of loans; great lakes student loans, wells fargo student loans, student loan chase, etc. Results are mostly long-tail Commercial Investigation queries around loan payments, student loan consolidation, student loan forgiveness for teachers, student loan payment help, etc. Last, but certainly not least. The crème de la crème of an FAQ page. Results reveal long-tail student loan questions (mostly Informational), like: can you file bankruptcy on student loans, do student loans affect credit score, are student loans tax deductible, where can i get a student loan, etc. Google Keyword Planner has limited search volume data, but continues to provide a broader set of top-of-funnel keywords (high volume, low competition <– ad metric). Despite the “closely related” filter resulting in a more even percentage of all 4 keyword types, it provided fairly similar results (35.4% duplicate) to “broad.” Commercial and Informational keyword types were most commonly found. Moz Keyword Explorer provides more accurate search volume data, while providing a broader set of long-tail keywords (mid-to-low volume, low competition). The many keyword filters provide a wide range of keyword results (17% duplicate in first two filters) and keyword types depending on which keyword filter you use. However, Informational, Commercial Investigation, and Navigational keyword types were most commonly found. The keyword search volume accuracy (IMO) is the most impressive part of this tool. The ability to view monthly trends, mobile versus desktop searches, and geo-popular areas is wonderful. Better UX. Can add negative keywords/keywords to not include in results. Keyword suggestion filters reveal far more keyword results. Sorting by 100 keywords is a nice cadence. The “are questions” filter is incredibly useful for things like FAQ pages and content marketing ideas. Google Sheet download integration. Saved keyword lists (that can be refreshed!? Say whaa!?) Average keyword bid (for further competition insight). Detailed SERP data for SERP feature opportunities. Monthly keyword trend data (on hover). Organic competition metric. Ability to target specific hyper-local areas. Ability to prioritize keywords which influences the Potential metric (for smarter keyword prioritization). The Min Volume | Max Volume | Difficulty | Opportunity | Importance | Potential can be overwhelming. Search volume ranges are widely skewed and bucketed. No Google Sheet download integration. Individuals who start adding keywords from the bottom up of a list (scrolling up) will miss newly populated results. No “select all” option. Broad & Closely Related filters tend to provide very similar results. The list of 1,000 keyword results can be daunting when doing lots of keyword research. No SERP feature data. Inability to target specific local regions. Can’t save lists. I’d consider where you want to target people in your sales funnel, and where you need to improve your current website traffic. If you have wide top-of-funnel traffic for your product/service and need to better provide long-tail transactions, check out Moz Keyword Explorer. If you need a brief overview of top-level searches, take a look at Google Keyword Planner results. I’m a little ashamed to say that I still use both. Checking Google Keyword Planner gives me the peace of mind that I’m not missing anything. But, Moz Keyword Explorer continues to impress me with its search volume accuracy and ease of list creation. As it gets better with top-of-funnel keywords (and hopefully integrates competition up front) I would love to transition completely over to Moz. 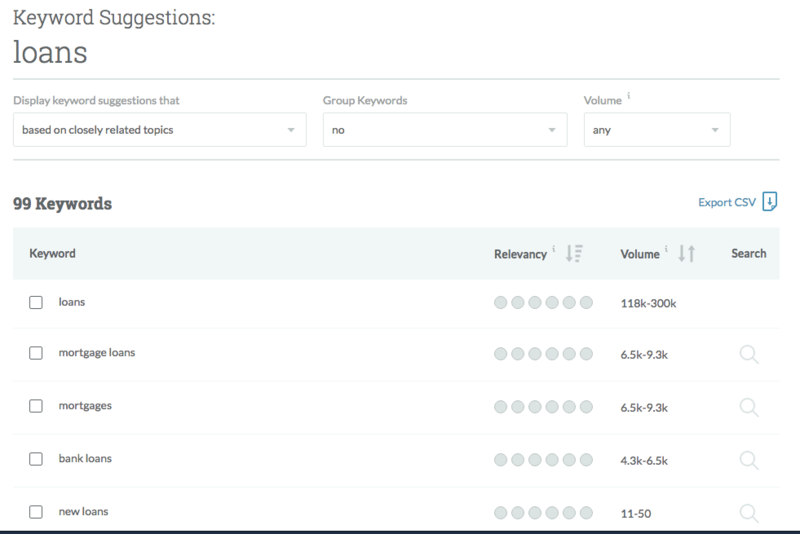 I’ve also been a big fan of ubersuggest.io to give your initial keyword list a boost. You can add your selected keywords directly to Google Keyword Planner or Moz Keyword Explorer for instant keyword data. This can help identify where you should take your keyword research in terms of intent, sub-topic intents, geographic, etc. Answer the Public is also a great resource for FAQ pages. Just make sure to change the location if you are not based in the UK. Please let me know if you can think of other ways to determine the quality of keywords from each tool. Any other pros/cons that you would add? What other tools have you been using for keyword research?